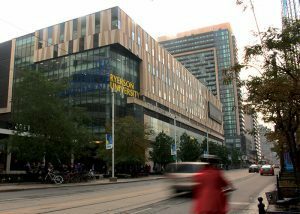 All classes are canceled as of 1 p.m. today due to freezing rain and “deteriorating conditions,” according to an email sent out by Ryerson Wednesday morning. Classes and labs are that are already happening or have been scheduled to run past 1 p.m. are canceled, and all university-run events, research labs, business services and administrative operations will be closed. Employees are advised to leave campus by 1 p.m. and those who have not left home yet should remain there. All student residences will remain open. Earlier today, Environment Canada issued a freezing rain warning for the city. They expect the freezing rain to continue through the evening and into Thursday morning. Highways, roads, walkways and parking lots may become icy and slippery as a result of the conditions. Updates to come from the university.